Examples, solutions, videos, worksheets, and activities to help PreCalculus students learn how to find the difference quotient of a function. The following figures show the Difference Quotient formula and graph. Scroll down the page for examples and step by step solutions. 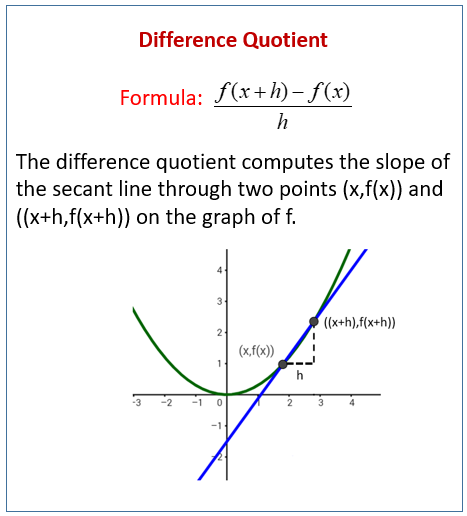 To find the slope of the secant line between two points in a function, we use difference quotients. Difference quotients are used with limits in the definition of the derivative and are important to understand, but can be difficult to compute and simplify. We can simplify difference quotients into a formula for finding the slope of a secant line. This video gives the formula for the difference quotient (the subtraction fraction) and do a couple examples of finding it for different functions. This video gives the formula for the difference quotient and do another example of finding it for a quadratic function.